When a new “coming soon” sign came up at the bad feng shui spot on the corner of Las Tunas and Mission, I thought nothing of it. 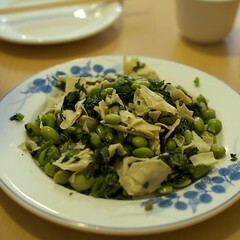 When I learned it was going to have Shanghainese food, I became intrigued enough to go there for lunch today. The appetizer of vegetarian chicken we ordered was tender, soft, and surprisingly flavorful. It even tasted a little bit like pork. But supposedly it’s vegetarian, amazing! 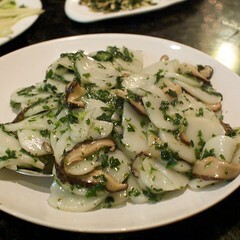 The Shanghai fried rice cake (sans pork) was typical. It had a good wok qi taste, but could have been a little more salty. Maybe because Will ordered it without chicken-msg, but it was a little bland. The standout at lunch was the shen jian bao. 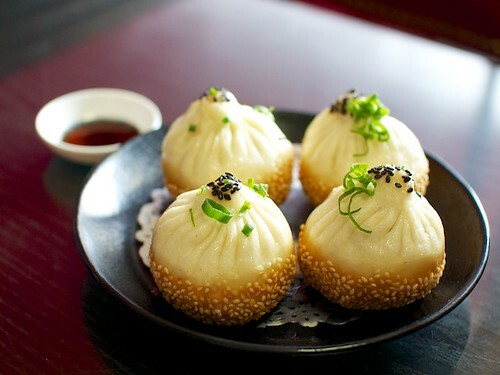 These come four to an order, but don’t dispair because they’re not your typical bite-sized bao‘s. 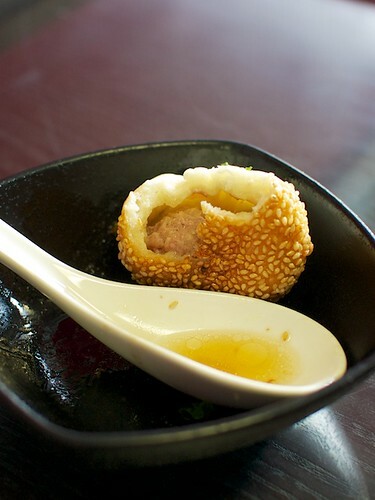 Judging from appearance, it gets a 10 because of the golden fried bottom adorned with white sesame seeds, and the pillowy white top decorated by a sprinkling of black sesame seeds and green onion. The texture of the bao was spot on: crispy and fried on the bottom, soft and airy at the top. The lava-hot broth was plentiful and rich and the meat filling was flavorful and savory. I liked that the ground meat was more roughly chopped and still retained some texture instead of being like a smooth round ball of meat paste. Dipped in a little bit of vinegar, slurped up with some soup, and then chased by a bite of the bun, it was perfect. The menu at Emperor Noodle contained a wide range of noodle soups that I didn’t get a chance to try, but next time, offal-filled noodle soups, you are mine! The neighboring table’s yellow fish noodles looked pretty good too. 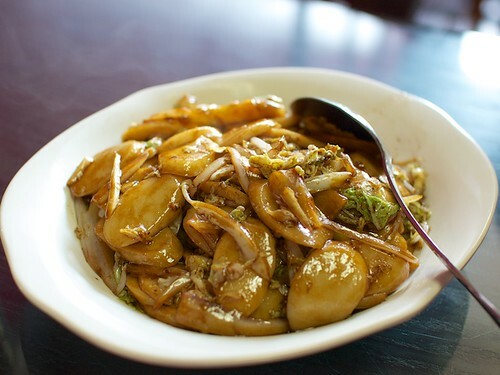 On my never-ending quest to find the Shanghainese restaurant, I ventured into Yu Garden, a newly opened Shanghainese Restaurant on the corner of Valley and Del Mar. Yu Garden is so new, it still has the new car smell. The walls are decorated with faux molding, the menus are still lacking the stickiness of well-worn Chinese restaurant menus, and the wait staff all still had that youthful, hopeful vibe in their eyes. When BF and I placed our orders, the waiter brought out a free appetizer plate of bean sprout salad. The sprouts were savory, sweet, and did their job whetting my appetite, but I couldn’t help wondering just how much MSG one would have to put in the sprouts to make them taste so delicious. After seeing a recommendation for the Chinese gourd (literally ‘shred melon’) with salted duck egg yolk on ExileKiss, I couldn’t stop thinking about the combination, so I ordered it. 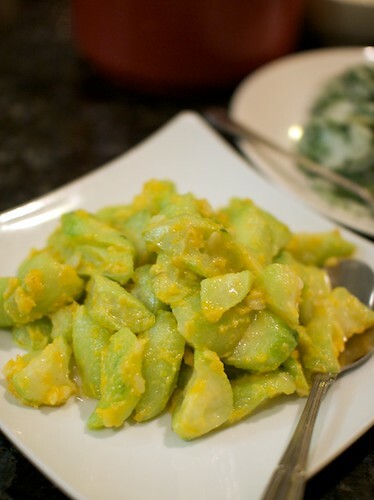 The usually bland but fresh tasting gourd was perfect with the creamy, salted duck egg yolk mixed in. Each bite was perfectly rich and soft, but never mushy. 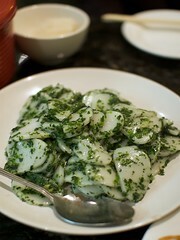 Since tasting this dish, I have to wonder, why would anyone eat this vegetable any other way? The BF ordered his usual rice ovals (nien gao) with Chinese spinach. The version on the menu, despite just listing the vegetable, also comes with slivers of ground pork, so if you want to order a vegetarian version, make sure to specify that. 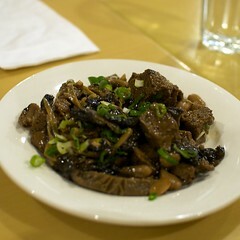 The nien gao was satisfying and chewy without being too hard nor too mushy. 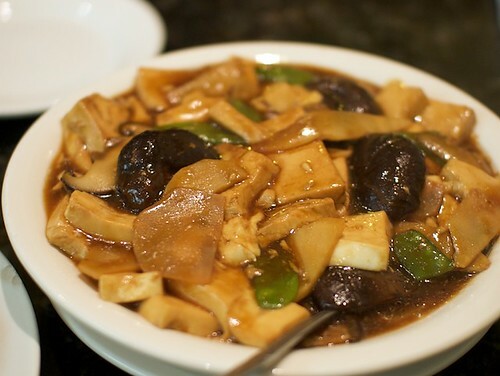 On our second visit, we ordered a different nien gao dish, the Shanghai style nien gao (but also vegetarian) and the only difference was that it came with slices of fresh shiitake. Also worth ordering if there are vegetarians at the table is the braised tofu. 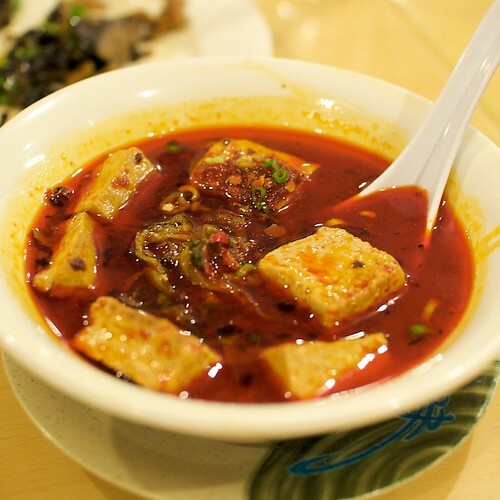 The braising liquid is a bit sweet, typical of Shanghainese cuisine, but does a fine work of penetrating the custard-like soft tofu. On a subsequent visit, I ordered the braised wheat gluten puffs, which had a more solid texture than the airy, light puffs I was used to. If those puffs could be soaked in the tofu’s braising liquid, I’d call that dish a success. My modus operandi is to order a kau fu appetizer at a Shanghainese restaurant, but I decided to switch it up. Thanks to the suggestion from my dad, I ordered the baked tofu and Shanghainese wild greens which were both chopped finely and put onto a palte. 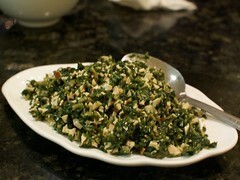 The greens (ma lan tou) had an herbal taste that brought out the savory flavor of baked tofu. 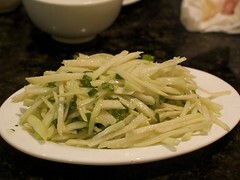 I also ordered a julienned chaoyte dish which was crispy, simple, and tasty. Maybe it’s because on my first visit, I ordered all vegetarian dishes and the waiter thought I was vegetarian, but I wasn’t offered the free plate of stir fried shrimp. They did bring out a plate on my second visit and it was fantastic. Even my picky-about-seafood mother enjoyed it. Each unshelled, head-on shrimp was coated lightly with a salty, sweet, sauce that left me licking my fingers after pulling the head off each shrimp and sucking the shrimpy goodness out. 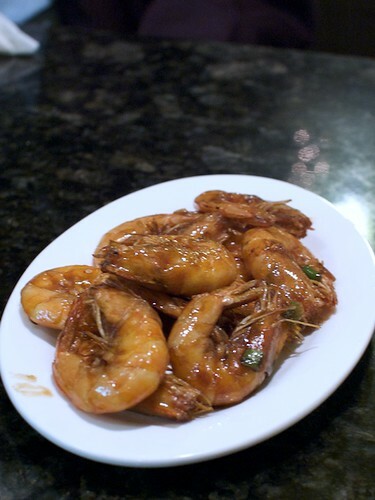 The shrimp was so good that the seafood dish I actually ordered, fish slices in a Chinese wine broth fell short. The broth was so delicate that I could barely taste any hint of the wine, which was unfortunate because a stronger tasting broth would have masked the fishy taste of the fish better. Yeah, yeah, don’t eat fish if you don’t like a fishy taste, but fish isn’t supposed to taste fishy if it’s fresh. Having one dish I disliked out of the many that I ordered isn’t that bad of a start for a restaurant. Considering it’s still their first month of opening and they probably have a few kinks to work out in the kitchen, it’s not bad at all. It certainly seems like the kitchen staff hit the ground running. I think I may have just found my new favorite Shanghainese restaurant. I also like the waiters. They’re accommodating, pleasant, and speak Shanghainese to each other. It’s great that they’re brutally honest about MSG. There’s no stigma against it in the kitchen, that’s for sure. When the waiter realized that the BF could eat regular MSG and not chicken flavored MSG (chicken bouillon cubes), he offered to take a dish he just brought out back into the kitchen to add some MSG for flavor. Another time, my mother asked if there was a lot of MSG in some dish before ordering and the waiter remarked, “That’s where all the flavor comes from!” That’s not to say that everything is laden with artificial flavor enhancers. Most of my dishes tasted great, but I wasn’t excessively thirsty afterward like some other restaurants which use a lot more MSG. I’m glad that there’s yet another Shanghainese restaurant on Valley Blvd. I’m even more glad that it’s one that has decent dishes. 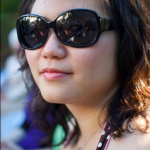 I may also be biased because the restaurant is named after one of my favorite (albeit touristy) areas of Shanghai. I’m definitely going to have to go back to try some of their xiao long baos next time. I can’t believe I went twice without ordering them. The city of Wenzhou may not be known for their cuisine like other parts of China, but I was still excited to learn about a restaurant which supposedly has dishes from Wenzhou. Ding’s Garden is also known as Savory Garden and also known as 大合卤味 — it all depends on which sign and menu you look at. The restaurant is incredibly small with just a handful of small tables and a glass display case which holds various cold appetizer plates and brined duck. Of the appetizers, I’ve had the pickled cabbage, kao fu, tofu sheets with pickled snow cabbage, and braised thin-sliced pig ears. 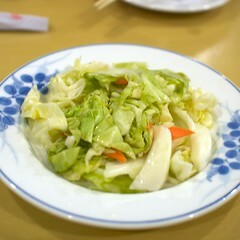 Their pickled cabbage, one of the best renditions of this dish, was crisp, sour, and a little spicy. The kao fu was even better because it was soft, slightly sweet, slightly salty, and without any of that canned food taste. The tofu sheets were also a good choice, especially after having such a bad experience with them at another restaurant. 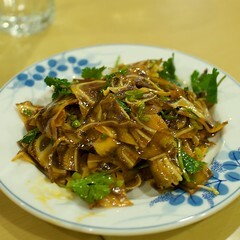 Finally, the thin-sliced pig ears were fantastic — salty, spicy, soft and slightly crispy with cartilage. If you’re a fan of pig ear, definitely try these. 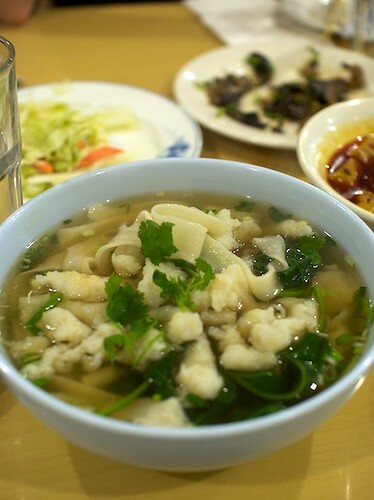 My first time here, I wanted a traditional Wenzhou dish, which I heard involved fish balls. They may not sound too appetizing, but they’re harmless; they’re just like meatballs but made out of fish instead of beef or pork. I ordered the fish balls in noodle soup. The fish were less ball shaped and more rustic, like small strips of fish. Each bite contained the cooked fish batter which was both soft and chewy with chopped ginger mixed in. While the fish was new to me and interesting, the star of the dish was the noodles, which were wide but thin — kind of like wider, thinner fettuccine. Even though these were wheat noodles, they had that slippery mouth-feel that rice noodles like the ones in chow fun had. This was the first time I’ve had wheat noodles like this and I really enjoyed them. The BF also wanted to try the noodles, so the lady working there was nice enough to offer us off-menu a vegetarian noodle soup with just pickled snow cabbage, water, salt, and noodles. The dish was simple and a great way to highlight the noodles. 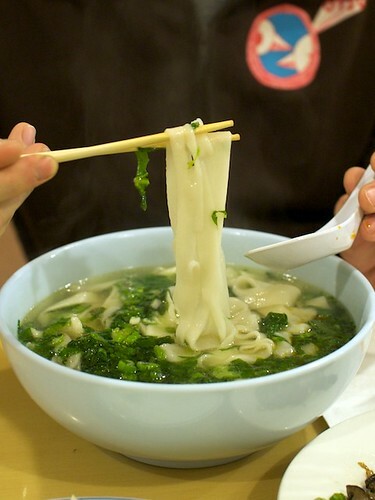 Next time he orders this, we’re going to ask for some pickled mai gan cai which’ll probably add another layer of depth to the soup thanks to its slightly earthy flavor. 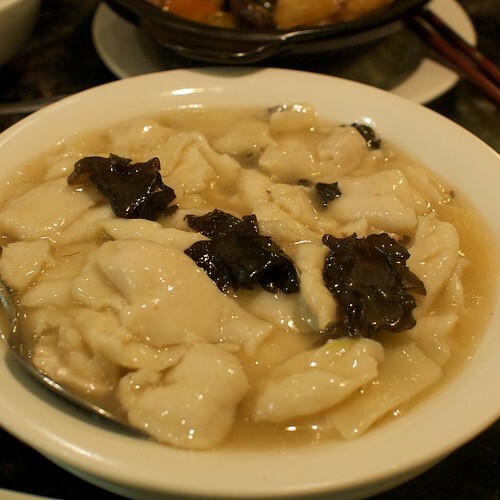 When I visited Ding’s Garden a second time, I tried another specialty of theirs: large wontons in soup. 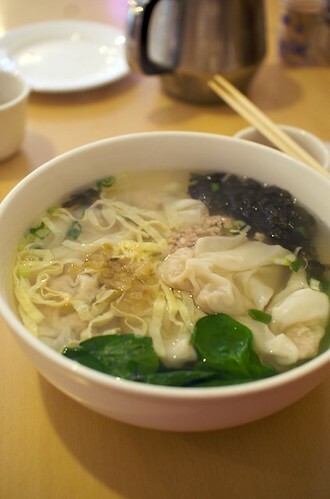 The wontons were casually squeezed in large, thin wrappers and then cooked in a simple soup with seaweed, strips of thin omelet, and ground pork. It may not look like much, but this bowl of soup and wonton was so warming and comforting that I don’t know how I’ll force myself to try something new next time I return. Even though there are no noodles in this soup, rest assured that it’s more than enough to eat thanks to the large wrappers and the amount of wontons. Maybe not for novices, but Ding’s Garden also has decent stinky tofu. It’s stinky, but not blow-your-socks-off stinky. 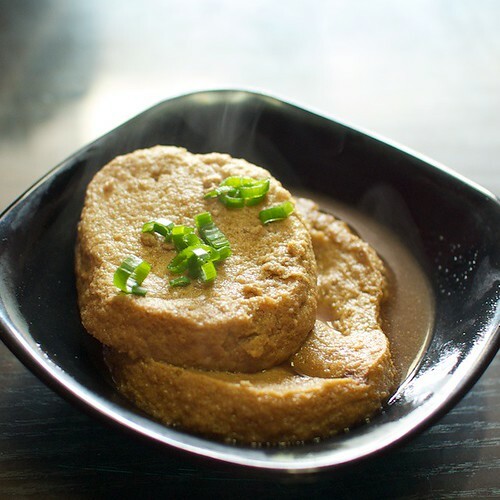 The braised tofu with chili oil is savory and salty inside, maybe a bit too firm, and pairs perfectly with a bite of the pickled vegetables. Don’t be scared away with the redness of this dish. Its bark is worse than its bite. Ding’s Garden may not look like much, but most of the food I’ve had here was solid and tasted like no-frills, good, Chinese food. The lady who works there is friendly, the noodles are good, and the prices are low. It may be too small for large groups, but it’s perfect for a quick, casual lunch when I’m in the mood for simple Chinese food.